A shark mauled a teenager in Russia’s Far East in the second shark attack near the Russian coast of the Sea of Japan in 24 hours, a local emergencies ministry spokesman said on Thursday. He said the shark attacked the 16 year old on Thursday near Zheltukhin Island. The teenager suffered injuries to his legs and was taken to a hospital in Vladivostok. Doctors say the victim is currently being prepared for a surgery and believe they will be able to save the boy’s legs from amputation. “A primary surgical removal of unhealthy tissue from the numerous bite injuries in his lower limbs is underway. Surgeons believe amputation will not be necessary and the boy’s legs will be saved,” a Health Ministry spokesperson said. 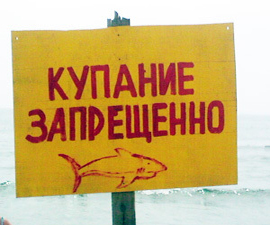 On Wednesday afternoon, a 25-year-old man lost both hands during a shark attack in Telyakovsky Bay near the village of Vityaz in the Far Eastern Primorye Territory. He underwent surgery and his arms were partially amputated. He is currently in intensive care and doctors say he is in stable condition. An ichthyologist from the Institute of Marine Biology in the Far East said on Wednesday the first shark attack was most likely related to the presence of feeding grounds, as anchovies move towards shallower waters to warm themselves, though this usually occurs at the beginning of summer. The only shark species native to the territory is the dogfish shark, which have never been recorded to attack humans. However, several white sharks, which can be dangerous to humans, have been detected in the area in the past few years, including a two-meter white shark caught in 2007. Note: There is a related video in our Video Section ( HERE ). Source: RIA Novosti , Photo Credit: Victor KONOPAK.